Here are the details, if purchased before Christmas $109 delivered! 1. The ubitx is now available for sale, for $109 dollars (includes the shipping), but only until Christmas. *After Christmas, the price will increase to $129 dollars. for this initial batch, a few ham volunteers and I pitched in to sort the crystals, test the coils, tune-up and box these initial kits, we won’t be able to do that any more. we will have to hire more people (which is not a bad thing) and get them to do it. 2. The ubitx is on sale at hfsignals.com, not hfsigs.com. it is easier to remember. we will soon point hfsigs.com to the new website as well. The new site is in wordpress, that means that we can have volunteers writing and updating it rather than waiting for me to hand code the content in html and vi editor. These apart, the early buyers must be aware that they are beta users of sorts, the firmware will sure get updated. i hope there won’t be any revisions of the PCB. Just as an aside the original price of the Heathkit HW-8 was $139.95 (in 1970 dollars) and it became a QRP Classic. The uBITX may become one as well and like the HW-8 there will be (and already are) all sorts of mods/additions one will be able to do. The uBITX is 10 dollars cheaper (after 12/25) works 80-10 M, does SSB in addition to CW, and is a Superhet to boot! Farhan your hit this one out of the Ballpark! Very cool, Pete! I am very tempted to purchase the uBITX transceiver before Christmas and have it delivered via DHL service. The only thing holding me back is simply the amount of projects I have on my table at the moment! $109 is an incredibly low price for a full-fledged QRP transceiver! I’m absolutely amazed that it is also has a general coverage receiver. Perhaps the uBITX could serve the SWL as well as the ham radio operator? I suppose we shall soon find out! Click here to read our other posts regarding the uBITX transceiver. Click here to order the uBITX transceiver kit. Please comment if you plan to or have purchased the uBITX. We’d love your feedback! 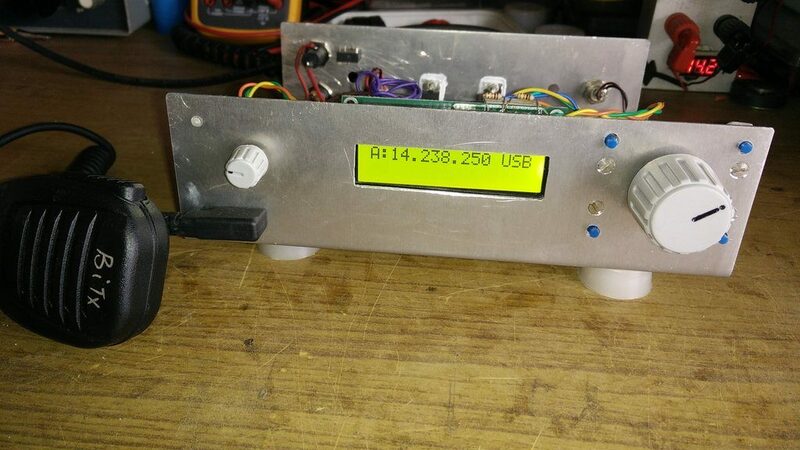 This entry was posted in Announcements, Kits, News, Product Announcements, QRP, QRP Radios and tagged Pete (WB9FLW), QRP, QRP Kits, uBITX, uBITX Transceiver. Bookmark the permalink. i just ordered ubitx today; it has gotten me excited; i had gotten softrock up and running but going to laptop became too much of a chore for me; this will hit the niche right. will post once i get it. my interest is firstly to connect it to a baofeng mic; next to build a box for it and understand ardruino itself for embedded systems programming prespective. I am listening to ubitx as I write this. It is an amazing unit. I got mine just before Christmas. Works very well. I have got a few suggestions :). But after all isn’t that what open source is really all about. We all make it ‘better’. I ordered the uBITX before Christmas and received it Jan 02 DHL – incredible service. While I am waiting for the right enclosure to be announced (several options, but waiting for one designed specifically for this model), I will comment on the board itself. While the design could have been made smaller, I am very pleased that it was not. This is the cleanest board I have ever seen, with room to work on it, add things, or change things. With all of the mods/additions already being discussed, this promises to be a real experimenter’s delight. For me, I am excited because it brings back some of the thrill of having a real hand in the design of the radio itself, and a t a price you are not afraid to experiment. And of course, thrilled that it is also a shortwave radio! Cheers! Already several weeks with the µBITX. Great to have, missing some details, like an AGC, it would have been great to have that implemented of factory. Running KD8CEC software on mine, nice features already like CWU, CWL, corrections on BFO, memories and many more. CAT control via Logger32, ham radio deluxe and more logger programms. Lots of people working on designing add-ons (amongst them AGC ) which makes it great for the ham who wants to do some things himself. For the price you have to pay for it it is a wanna have for everyone I think. Hi First post on this forum. I’m interested in the uBITX xcvr. Is there a way to vary to output power down from 10W? I’d like to have ability to drop output to 1W or less. It would be great to have a variable power output control. Anyone looked into this? Also, I understand there is an updated version of this transceiver (HF1). Is that described anywhere in detail, or available as a kit? What are the differences of HF1 and uBITX rigs?